TRYOUTS - Thank you to all the players that attended the 8U and 10U tryout April 7th. If you want to tryout but were not able to make the tryout please register on the LGSL registration page and send an email to requesting an alternate evaluation. The 12U tryout will be held on April 28th, from 4:00 - 6:00 PM at Philip Bolen Park, field #5. Please register on the LGSL registration page. PLAYERS - The LGSL Freedom All-Star Program is a fully self-funded extension of our House League offering registered house league players an opportunity to compete in double headers and tournament play against other All Star and 'C' Level teams in the Greater Washington Metropolitan Area. The season generally will run from May 1 through July 31. Each divisional Team Manager develops the schedule for his/her team. Q. Should my daughter try out for the team? A. That depends. Does she want to have fun, improve her skills, make new friends, and compete at a higher level of competition than house league? Does she want to experience what being on a travel team is like while not actually travelling that far from home? Does she want to get a head-start on the fall season? If so, then Freedom is for her! Q. When are the tournaments? A. Each coach will determine the schedule, however this season (2019) there are local tournaments in Loudoun on May 25-26th, June 15-16th, 22-23rd, and 29-30th. There are also tournaments in Maryland on July 6-7th, and 13-14th. To round out the season there is a tournament in Chambersburg, PA on July 20-21st. That said, most teams will only play 3-4 tournaments. The 8U team will play in the Loudoun tournaments and hopefully the PA tournament (it's lots of fun! ), while the 10U team will play in the Loudoun tournaments. Q. When are the practices? A. This also depends on the coach. During the house season we will only be practicing on Sundays. Once house is over, practice will move to weeknights. Expect one or two practices per week. Q. I have a vacation planned in June/July. Can my daughter still participate? A. Generally, yes, as long as you aren't planning on missing multiple tournaments. We understand people may miss some practices or tournaments due to vacations and do not expect 100% participation. Q. Do tournaments take up both days on the weekend? A. Yes. Generally, tournaments are pool play (2-4 games) on Saturday followed by a single-elimination bracket on Sunday. A. This depends on how many tournaments your team plays and how many girls are on the roster. The field/uniform fee will be about $100, while the tournament fees should be about $150. If your team gets sponsors it will offset this cost. Q. My daughter recently moved up divisions but is still age-eligible for the lower division, can she play down? A. Yes, but on a case-by-case basis. For example, if she recently moved up to 10U and it makes sense for her development to play 8U, then she can tryout for 8U. Please email the Freedom Director about these cases as it will need to be cleared first. We don't want the majority of girls on the team to be from a higher house division. Q. Are the rules different than house? A. Yes! We have a lot of rules in house that make it easier for girls new to softball to play. These do not exist in tournaments. Specific differences for 8U are: coach pitch, 3-strikes for an out (5 pitches total), no overthrow protection, play stops when the ball is in the pitcher's circle, and no position limits. When the differences for the rest of the divisions are determined they will be updated here. COACHES - We are still accepting applications for 14U! Applications for the 2019 Season will be accepted starting at the LGSL Spring 2019 Coach's meeting and will be due no later than the LGSL April Board of Directors meeting. You must be a registered LGSL coach to apply. If you would like to manage our aspiring tournament players, please click HERE and download the application. Once completed, please email the application to the or bring it with you to the 2019 Spring Coach's meeting for Board consideration. For more information about the program, check out the LGSL Freedom Program Manual under Documents from the menu on the left. 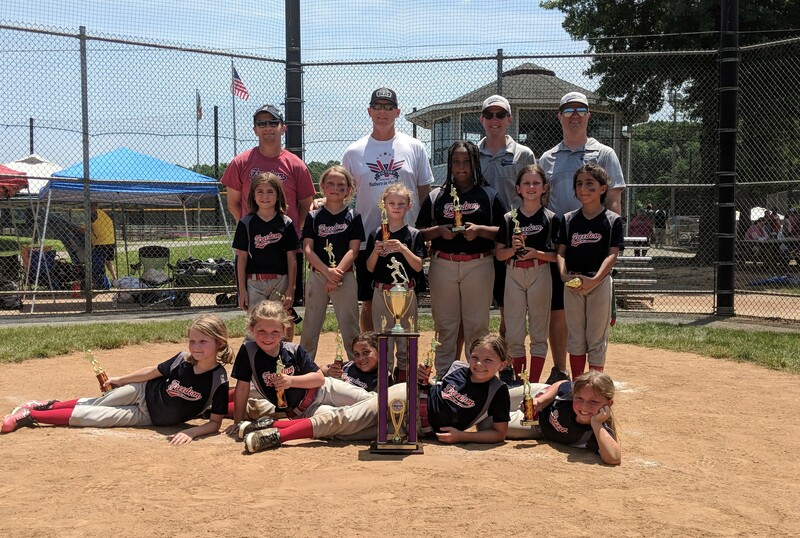 Congratulations to the 8U Freedom team on their 2nd place finish in the 2018 Loudoun Firecracker! Good Job Ladies!!!! Congratulations to the 12U Freedom team on their 2nd place finish in the USSSA Mid Atlantic Regional Tournament in Maryland on 7/7/2018! Great Job Ladies!! !